When I opened my shed door yesterday morning, I almost walked straight into this queen wasp who had just started building a nest inside the door frame. This queen will have over-wintered and is now desperate to build a nest, lay her eggs (that were fertilised at the end of last summer) and start rearing her young. Sadly for her, the doorway of a shed I use every day wasn’t a good choice. I felt bad about it, but I removed the nest stem that she’d started to build, and then left the shed wide open all day to discourage her from coming back. I watched for a while as she frantically searched for where she’d begun building. But by the end of the day, she wasn’t around, so hopefully she found a more suitable place to nest. Through most of the year, wasps catch small insects and caterpillars to feed to their young, and in doing that, they can be very helpful as garden pest controllers. So I don’t mind wasps living in the garden, but just not right in the doorway of one of the sheds! 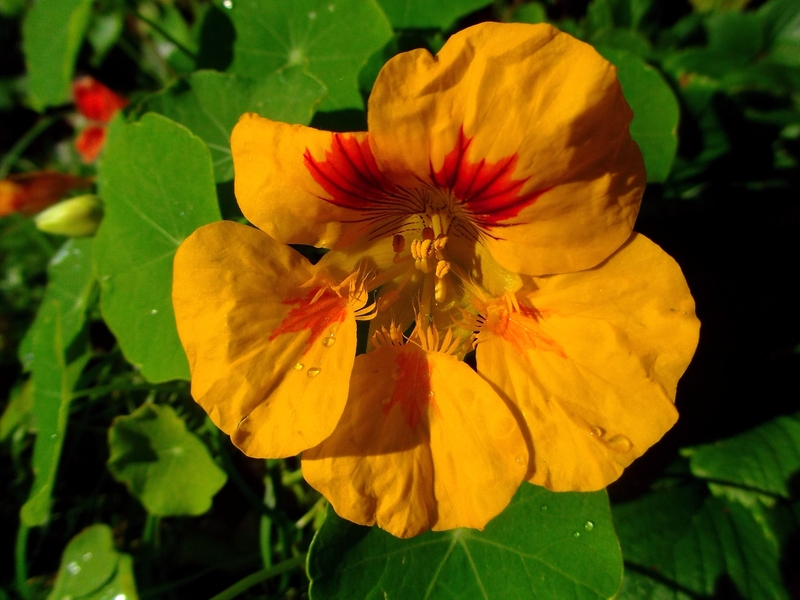 It’s nearly November, but the nasturtiums are still flowering prolifically. Earlier this year (April) I was given some seeds for Alpine Strawberries and I planted them without much care or expectation. They have thrived under this neglect and have been fruiting since August; perfect timing to complement the end of my main strawberry crop. 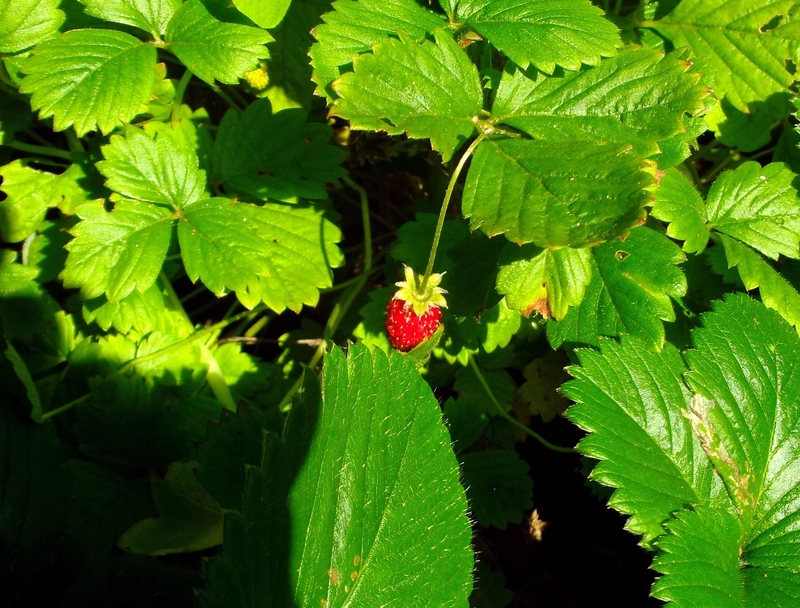 The fruits aren’t quite as nice as the true wild strawberries (which fruit here in June), but they’re very nice nevertheless. Another gift that thrives from neglect is a clump of Miscanthus x giganteus I was given years ago. 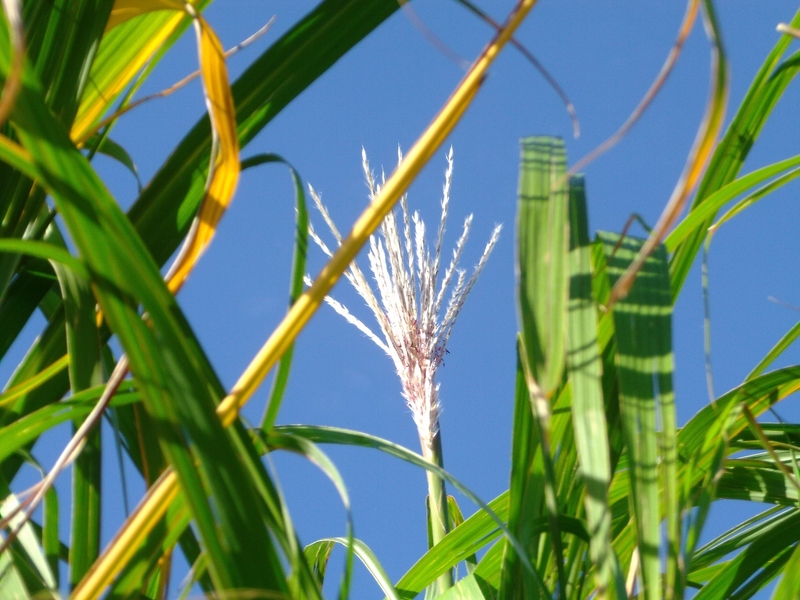 This is the hybrid Miscanthus that is used by farmers as an energy crop, but it works well as a backdrop or screening plant in a garden. It grows from nothing to eight feet tall each year and flowers very late (but not usually this late). The dead stems will usually stand the winter and provide a favourite spot for insects and spiders to shelter in during the colder months. I chop the Miscanthus stems down each spring and then use the stems as a handy alternative to bamboo canes for all kinds of things around the garden. To keep the clump under control, I just mow over the spikes of new growth that try to grow where they’re not wanted. However, earwigs do evoke strong emotions for many gardeners. They are inquisitive and catholic omnivores, and they often seem to develop a taste for favourite flowers and fruits. Generally, they won’t do much harm, but they will chew raggedy holes and can eat out the petals from unopened buds. Sometimes a population explosion can mean that they cause more harm then usual. But by and large, in the average garden, they are likely to be doing more good than harm. As well as eating things you’d rather they left alone, they also eat lots of aphids and slug and snail eggs. They also help with nutrient recycling by eating up decaying organic matter. In many ways, they’re the natural janitors in the garden. If you do have a problem with earwigs (and you’re sure it is earwigs and not some other nocturnal muncher) the best cure is probably chickens – they’ll happily hunt them out and gobble them up. Encouraging natural predators to your garden, like toads and hedgehogs, will help too. 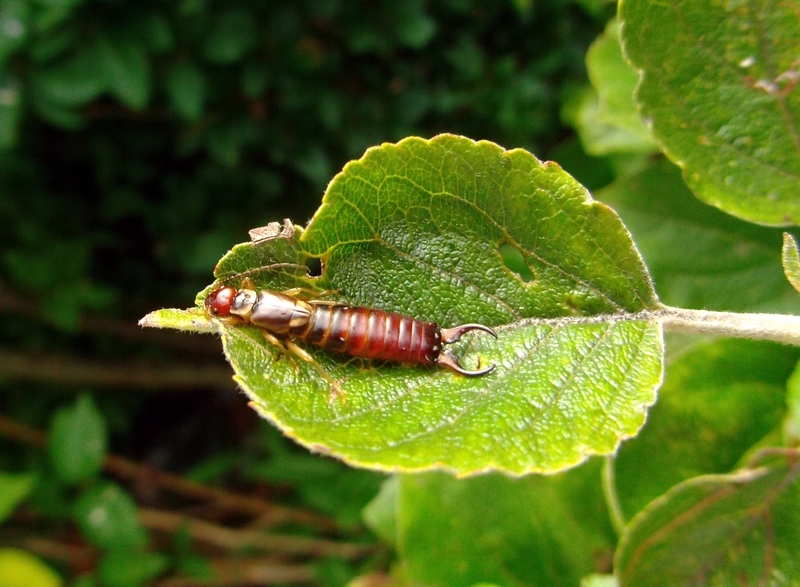 But if you want to be more proactive, the easiest way to catch earwigs is to create nice damp hiding places for them – with plant pots or saucers, logs or bits of wood. Leave these in place for a couple of days around the edges of your garden and the earwigs will move in. You can then collect them up and dispose of them. It’s common to see “tar spots” at this time of year, just as autumn is beginning to make its presence felt. 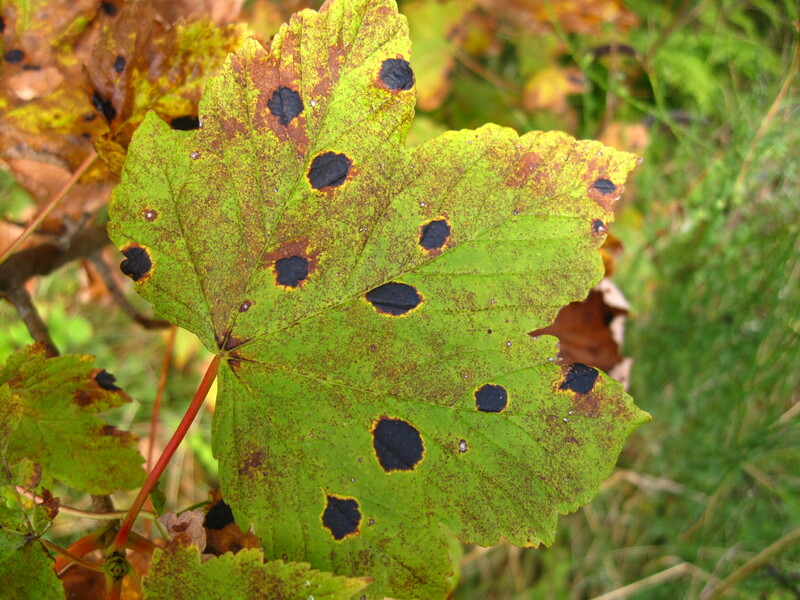 Tar spots are the black blotches that you often see on sycamore leaves, as well as on various maples. The spots are caused by the fungus Rhytisma acerinum, but they don’t do any harm. The fungus will overwinter in the leaves on the ground beneath the trees and then send out spores in the spring to re-infect a fresh batch of new leaves. Sweeping up and burning leaves might reduce that re-infection rate, but it’s unlikely you’ll ever completely be tar-spot free once it’s in your area. Traditionally it’s always been believed that tar-spots are an indication of clean air, but that’s more anecdotal than scientifically proven. These are the eggs of the large white (the clump of yellowish eggs) and small white (the single whitish eggs to the left and right) butterflies. Both butterflies are known as cabbage whites. 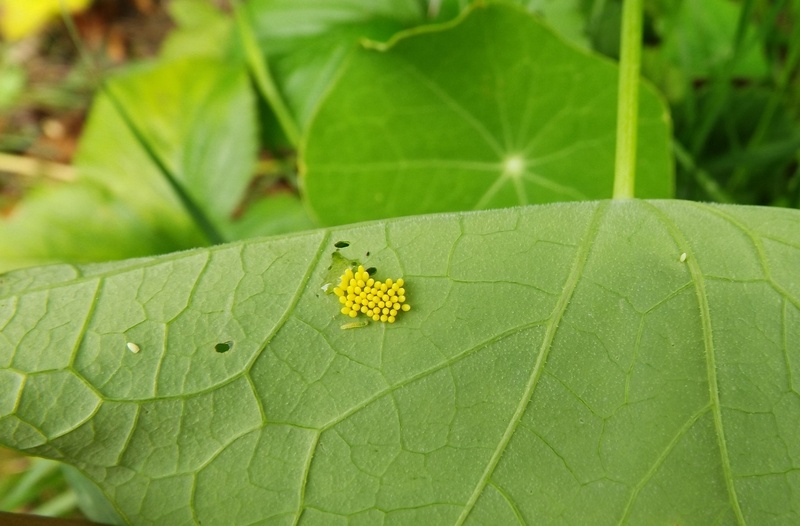 These eggs have been laid on nasturtium leaves: they prefer cabbages and other brassicas, but nasturtiums are a firm favourite food plant of the cabbage whites too. Eggs of the large white (Pieris brassicae) and small white (Pieris rapae) butterflies. And a tiny newly hatched large white caterpillar. I gave up growing cabbages in the garden because controlling the caterpillars of these two species of white butterflies on them was impossible. Well, impossible without chemicals. And I took the decision that gardening at home, for me, is gardening for fun and pleasure; it’s not about necessity or earning an income. So, if things won’t grow successfully without plant protection products, I don’t grow them. It’s a very different story when you’re growing a crop to feed your family or earn an income: choices are much harder then. The photo below was taken about a fortnight later: the caterpillars are literally eating themselves out of house and home! 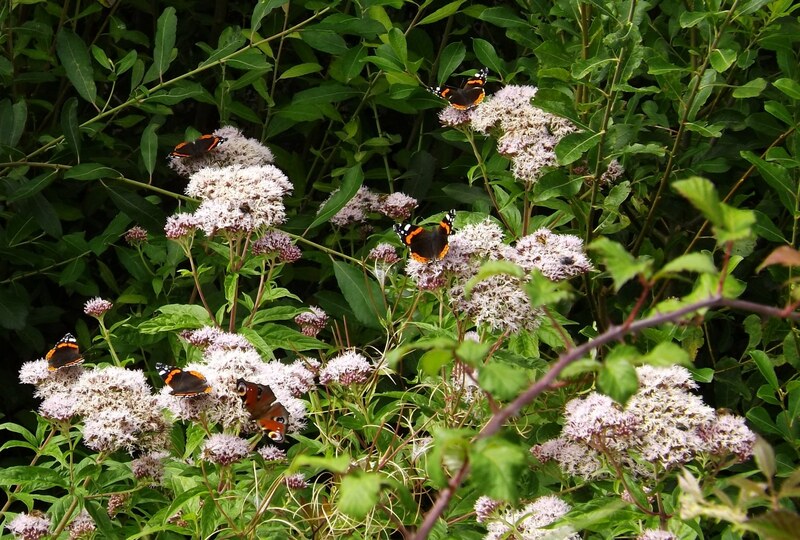 Hemp agrimony (Eupatorium cannabinum) is one of the very best plants for attracting butterflies: even better than buddleia. Despite its name, it has nothing at all to do with cannabis or hemp. Hemp agrimony flowers with red admiral and peacock butterflies. Hemp agrimony is a hardy perennial that is native to the UK. Although seldom grown as a garden plant, it is certainly worth considering if you are planning a wildlife area in your garden. It prefers soils that are moist a good deal of the time and quite a sunny position. Although it can be grown from seed, it is simpler and more reliable to divide a clump if you know somebody who has some they can share with you. The flowers, a frothy mass of pale pinky-mauve appear in July and August – just in time for many butterflies. The dried flowers and leaves of hemp agrimony are sometimes used as an infusion which has a mildly cleansing and toning effect. 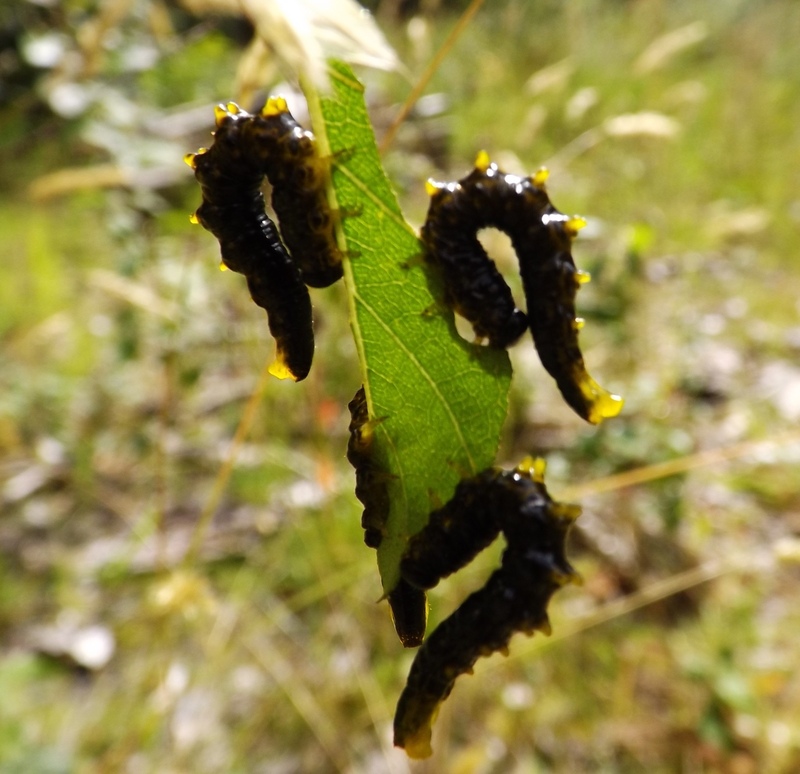 These sawfly larvae are making short work of devouring the leaves on this birch sapling. I think these are the larvae of Croesus latipes – I can’t find a common name for them. 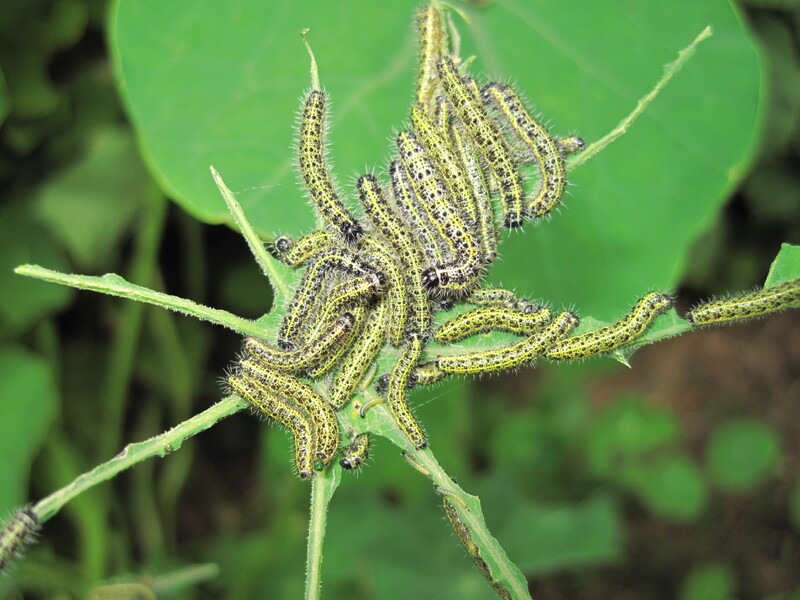 They are considered a minor nuisance, not a serious pest. 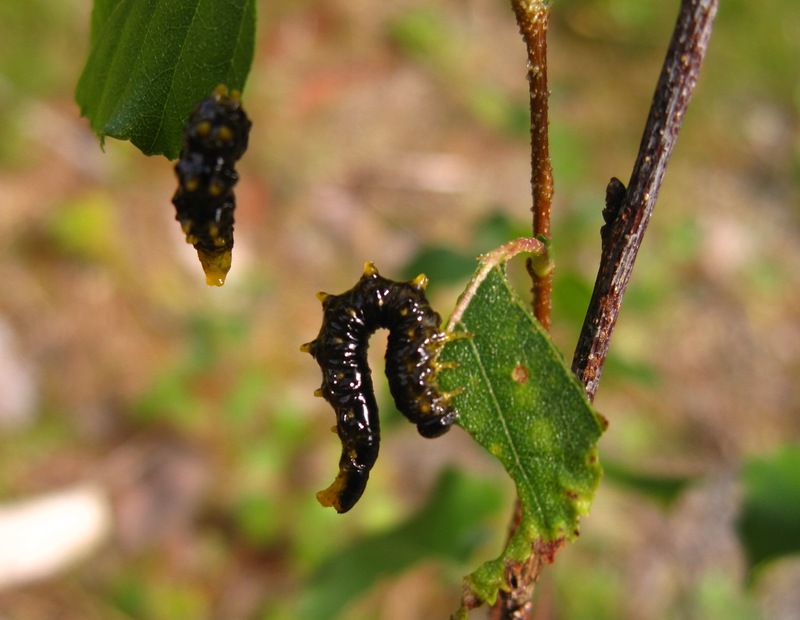 The posture the larvae are adopting is characteristic of many sawfly larvae. Also note the way their stubby little prolegs start from segment five (the first three pairs of legs are the proper legs that will remain in the adult, they are on segments one, two and three). 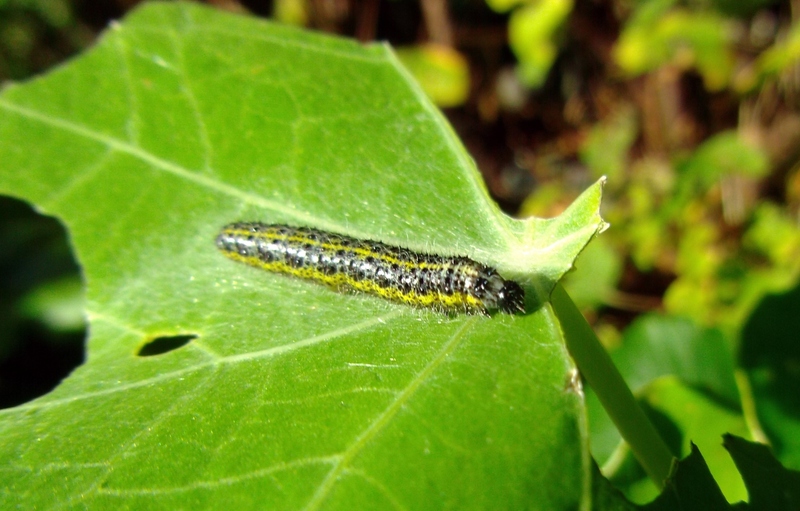 Generally, caterpillars of moths and butterflies have fewer prolegs than sawfly larvae and they start further back than segment five. Have a look at the post about caterpillars on redcurrants for a labelled photo showing the segments, legs and prolegs.